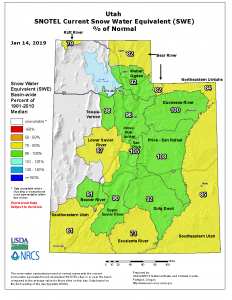 Officials with the National Resource Conservation Service say snow levels in Utah are currently below the state’s typical average. The NRCS report says the snowpack for the Bear River Basin is only at 82 percent, with the state, overall, at 92 percent. Although those numbers represent a snowpack below what is expected this time of year, it is up significantly compared to a year ago when it was only at 51 percent. More winter storms are expected to impact the area throughout this week with a couple of inches of snow expected in the mountains and a possibility of rain in the valleys on Thursday. Snow water levels throughout Colorado and Nevada are similar to Utah, but levels are well below normal in Idaho, Oregon, Washington and portions of Wyoming. More than a dozen reporting stations in those states are recording snow water levels between 50-75 percent of normal. As of January 1, 2019, reservoirs throughout the state are currently at 70 percent of capacity, which is 99 percent of where they should be at this time of year. Locally, Hyrum Reservoir is at 63 percent of capacity, Bear Lake is at 62 percent, Porcupine Reservoir is at 61 percent and Willard Bay is at 60 percent. That means Hyrum Reservoir is 96 percent of average for this time of year, Bear Lake is 139 percent of average, Porcupine Reservoir is 106 percent of average and Willard Bay is at 98 percent of average.